Have you ever been about to go out, and then you realize you don't have the right coat? So you end up wearing something that doesn't go with your outfit, or even worse you don't wear anything and then spend the whole night freezing. Being confident in your clothes means being prepared. Sometimes the thing that makes you insecure is not your outfit or your body, but not having something necessary in your closet. This is actually a GOOD THING because it's a much quicker fix. Ya just gotta have the right things in your closet. So this fall, let's put an end to that feeling. Girl, no one wants you standing out in the cold. Also, fall jackets are the beeeest, so there's that! Before I go through each piece, there are 3 essential tips that help when picking your outerwear for the fall season. 1) Make sure you have different color options. Brown and black are must haves. Those two are the most important to go with shoes and belts. Other colors like dark green, rust, gray and tan are perfect additions to round out your color palette. 2) Different details make each piece feel unique and serve different purposes. Maybe one has zipper details and the other has more feminine ones. Maybe one has a longer length and one is is waist length and a side zipper. Think about having different options for versatility. 3) Practicality plays a big factor. Make sure at least one is waterproof. This is CRUCIAL. If all your outerwear is cute for a fall day with a slight breeze, what happens when it rains?! Ok, so now that we covered the basics, let's dig a little deeper into each piece. Brown Lightweight Jacket (similar) - Mine happens to be vegan leather but yours can be anything that's easy to throw on when your shoes and belt are brown (or a color that doesn't go with black easily). I personally like having a brown leather and a black leather and both get worn often. 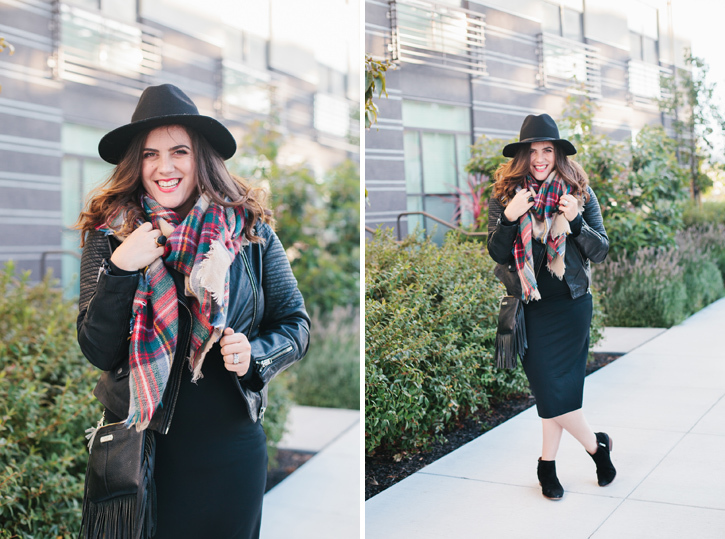 Black Leather Jacket - A black leather jacket is such an important staple. It works over a tee shirt, a dress, you name it. Love love love it's timeless appeal. Green Military Style Jacket - So it doesn't need to be green, but something in a different color (brown and tan work too). I love that this style of jacket is cool and fashionable but also completely functional. Red Suede Moto Jacket - Suede is just killing me lately. I'm INTO it. Probably because I can't really have a lot of it with all those baby stains. Seriously, milk stains man... #momlife This color red just screams fall. I love having a variety of colors that are versatile but still current and fresh. Camel and Gray Cape/Sweater - Ok, so I guess Anthropologie calls this a poncho but really, to me you just want something chic and comfortable. The joy of a piece like this is that you can wear it with a white t shirt and jeans and it completely elevates the look. So, what is your go-to jacket for Fall? Do you have the options you need? You may have heard the Fall round of The Confident Closet is open for enrollment RIGHT NOW. If you sign up by Friday (September 23rd) you will ALSO be getting a 30 min Skype session with me! It's the perfect opportunity to get your closet in tip top shape. Click here to learn more and enroll! Happy Fall!